For couples in committed relationships, assisting them in understanding and applying to their own marriages, groundbreaking research about what makes marriages work, versus what makes marriages deteriorate and ultimately fail. The Seven Principles for Making Marriage Work is a workshop designed for couples in committed relationships, which aims to assist them in understanding, and applying to their own marriages, the research about what makes marriages work, versus what makes marriages deteriorate and ultimately fail. Participants in this workshop will learn, and have the opportunity to practice, in a private and safe setting, the skills that have been developed from the Seven Principles ground breaking research findings of award-winning therapist Dr. John Gottman. (3) creating a couples sense of shared purpose and meaning. This psycho-educational workshop, developed by the Gottman Institute, is based on the four decades of acclaimed research by Dr. John Gottman and Nan Silver, which was published in their New York Times Bestseller The Seven Principles for Making Marriage Work. If you haven’t yet heard of him, Dr. John Gottman, is a world renowned researcher and therapist in relationship stability. 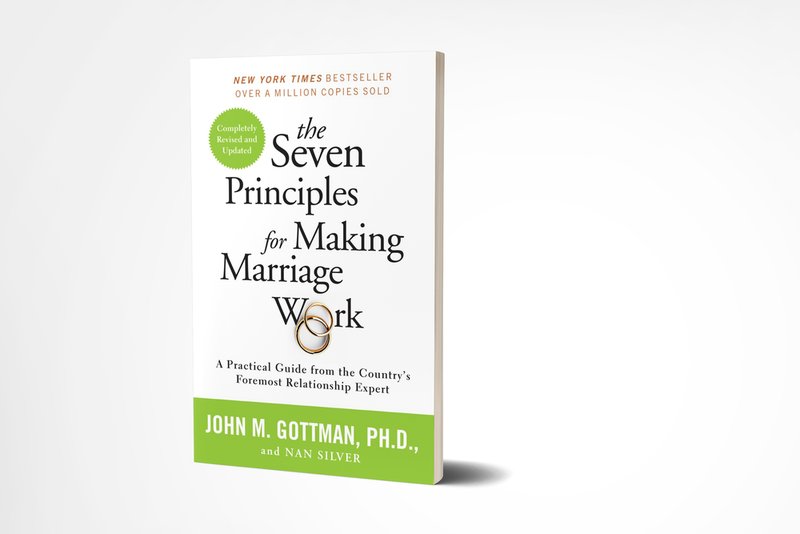 Having been awarded many accolades for his research, including being recognised as “one of the top 10 Most Influential Therapists of the past quarter-century”, Dr. Gottman also lays claim to the ability to be able to detect with 91% accuracy, which couples will divorce and which will stay together. He describes himself as not being very popular at dinner parties! It is our hope that whether you have been married for 30 years, whether you are newly engaged or whether you are at the 7 year itch; that you will come along to this workshop to equip yourselves with the skills that evidenced based research has shown us, makes marriages work. Join us to Learn What it is to Really Love one another. If you are unsure if you should attend, contact us and we'll help you to assess if this workshop is for you. Kerrie and Adrian, your presenters, have been married since 2008, they are both Principal Psychologists, and Directors in their two psychology practices (Motivating Marriages Psychology and Motivating Minds Psychological Practice). They are both extremely stubborn, both right about everything – even though they don’t agree on everything! They really love each other, can really fight with each other and are deeply committed to marriage both personally and professionally. Can you just imagine the psycho-analysis flying around behind their closed doors! - The purpose of this presentation is two-fold, (1) offering participants insight into a next step, if they feel they need some more individualized treatment after their workshop skills training, and (2) to dispel the fears and myths that couples have about attending therapy. You will learn about Gottman Methods Couples Therapy, gentle, collaborative and non-blaming approach to helping couples understand what makes marriages work. Is the Seven Principles for Making Marriage Work something that your relationship might benefit from? No. The class does not include sharing problems and issues publicly. Couple's exercises are done privately. Must both partners attend or can I come alone? Since the class involves doing exercises together, both partners must participate. My partner isn't a reader. Can we still come to the class if he/she won't read the book? Yes, still come to class. While the book provides valuable information, the class lectures will summarise the content of the book. Each person will need the companion workbook however, to do the couple's exercises efficiently. Should we do the exercises in the book at home or save them for the class? The class will involve doing some of the exercises from the book so doing them first at home would duplicate some of them. In some cases, the directions for doing the exercises in class have been reviewed and updated from those presented in The Seven Principles book. The Educators also role play how to, and how not to do some of the exercises in order to help participants get the most of each exercise. There are some exercises in the book that the class will not have time to do, and couples are encouraged to do them at home after that chapter has been covered in class. We are currently only running the Seven Principles for Making Marriage Work workshop in the Sutherland Shire, Sydney, Australia, at the terrific venue space of Tradies in Gymea.